A motorcycle accident can have serious consequences in your life. At Motorcycle Lawyer, we work hard to figure out how the motorcycle accident has affected your life and find you fairness in the system. Having a motorcycle accident in B.C. If you had a motorcycle accident, you should know the motor vehicle insurance scheme in B.C. is superior to many auto plans elsewhere. For example, you are entitled to receive medical rehabilitation and partial wage loss benefits even if it is determined you were liable for the accident, not directly insured by the Insurance Corporation of British Columbia (ICBC) or were hit by an “out of province” vehicle. Coverage is also available when the other vehicle is uninsured or unidentifiable. Consequently, if you are injured and require care, it is assuring to know such broad protection is available. However, knowing is not enough. You need to understand your rights and responsibilities when dealing with the insurance company. 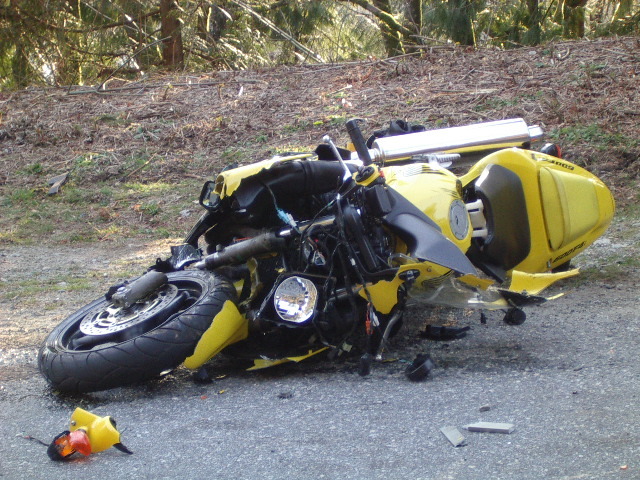 Motorcycle accidents can result in serious injuries. In these cases, ICBC will act quickly to defend its interests, so it is critical to seek legal advice and not be taken advantage by the insurance company. As part of the Insurance (Motor Vehicle) Act, ICBC must provide certain medical rehabilitation benefits and partial wage loss benefits to those that qualify. Medical benefits include access to rehabilitation specialists and various facilities. Wage loss benefits are calculated on past earnings and are called Temporary Total Disability benefits (TTD’s). Exactly what medical benefits and how much TTD’s a person is entitled to can at times be unclear. In less serious situations, ICBC may pay for up to 12 physiotherapy sessions. To receive further treatment, it may be necessary to obtain a recommendation from your family doctor. When injuries are more serious in nature, ICBC must take care of all reasonable medical, surgical, dental, hospital, ambulance, professional nursing services, as well as other rehabilitation expenses. If you are totally disabled for more than seven days and your disability appeared within 21 days of the accident, you may qualify for TTD’s. The amount available is 75% of your average gross weekly wage up to a maximum of $300 per week ($145 per week for homemakers). You may be required to apply for Employment Insurance (“EI”) benefits before you are eligible to collect TTD benefits. Once a claimant has been refused EI, exhausted their EI entitlements or require a top-up over EI, they will be able to collect TTD’s. Meeting the criteria to collect your benefits and continue receiving them can be confusing. The conditions are numerous and ongoing, sometimes resulting in foregone entitlements. These benefits are Part 7 of the Regulations for the Insurance (Motor Vehicle) Act. You may be entitled to certain benefits under Part 7 of the Regulations. If you do not receive these benefits and are entitled to them, it may be necessary to begin a Part 7 action or lawsuit. The action is filed against ICBC for failing to provide benefits guaranteed by Regulation. On the other hand, if you have been involved in a motor vehicle accident, you may be entitled to compensation for your injuries and loss. This is known as the Tort action. The Tort action is initiated against the negligent party that caused the accident. If applicable, you may claim for pain and suffering, past wage loss, future wage loss or loss of capacity, expenses for medical treatment and future care. If you have been injured in a motorcycle accident, you may be eligible to file a Tort action against the party that caused the accident resulting in your injuries. By law, you have a two-year window of opportunity immediately following the date of your accident to officially commence your legal action. Other limitations also govern your ability to file a Part 7 action. If you fail to start your legal actions in time, you may be barred from doing so, thereby forfeiting your entitlements. Sometimes ICBC will contact you and offer a settlement. From ICBC’s perspective, once the file is closed, future exposure is eliminated. The difficulty is that if you settle too early, you waive your right to future entitlements. This could be devastating if your injuries become more serious over time or latent injuries subsequently surface. You should consult with your doctor regarding your injuries and contact a lawyer to determine whether the amount offered is appropriate. If you have been involved in a motorcycle accident in B.C. you should consult with a lawyer before making any decision. Whether you have been seriously injured or just want to inquire about Part 7 benefits, call Motorcycle Lawyer. In most accident claims, we can act for you on a contingency fee basis or a percentage of the amount awarded upon settlement or after the trial. At Motorcycle Lawyer, you do not pay our fees unless we successfully recover an award. Note: This site is for information purposes only and is not meant to be construed as legal advice. For legal consultation, email Daryl Brown directly at Contact us or call him at 604-612-6848 or toll-free at 1-844-BIKE-LAW .